Director Denis McCaldin writes following news of the death of John McCabe. “Composer and pianist John McCabe CBE has died at the age of 75. A person of striking honesty, humour and integrity as well as being a fine musician, John managed a successful dual career as both pianist and composer. He studied at the Royal Northern College of Music under pianist guru Gordon Green, who fired his interest in Haydn by playing a Richter recording of one the keyboard sonatas. John recorded all the Haydn sonatas for Decca between 1974 and 1976, setting new standards of musicianship and insight into the music. The discs are still in the catalogue. We have received a message from our friends at the Royal Society of Musicians about the 20th Annual Jacqueline du Pré Charity Concert at Wigmore Hall on 3 March which we are pleased to share with you here. 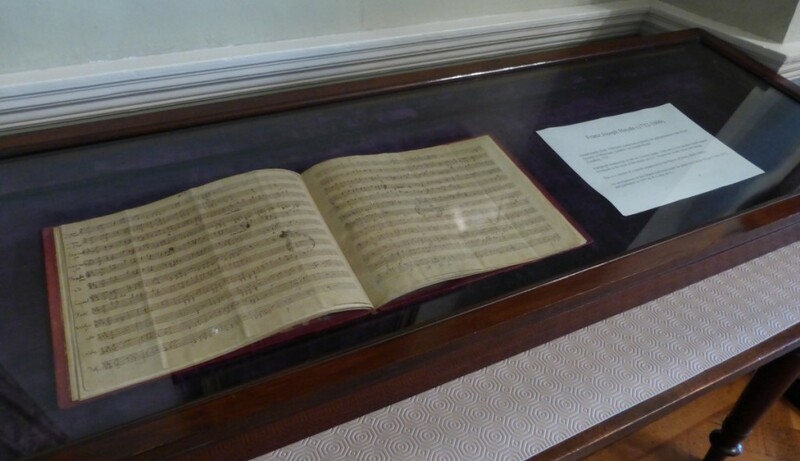 Haydn was invited to the annual dinner of the Royal Society of Musicians in 1792. For the occasion, he composed a march for orchestra, the autograph of which is still preserved by the Society. Three short marches for 3rd March 2015 have been composed especially for the 20th Jacqueline du Pre Charity Concert in aid of the Royal Society of Musicians of Great Britain. The marches have been written by Sir Peter Maxwell Davies, the Society’s President, Robert Saxton and Toby Young, who are active Members of the charitable organisation. Toby is the Society’s youngest Member. Two of Britain’s finest award-winning string quartets, the Sacconi and Navarra, are joined at Wigmore Hall by top British cellist, Guy Johnson in a programme of contrasts – the brilliant textures and vibrant colours of Bridge and Ravel and the titanic Classical quintet by Schubert. This will be the 20th Annual Jacqueline du Pre Charity Concert at Wigmore Hall, being performed in what would have been, poignantly, the cellist’s 70th birthday year. 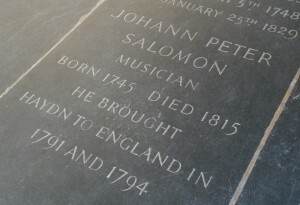 The Royal Philharmonic Society contacts us this week with news that they plan to celebrate the life of one of their early members, Johann Peter Salomon on the 11 March. The first leader of the Philharmonic orchestra, Salomon brought Haydn to London and commissioned some of his finest work for his subscription concert series. The plaque that we are subsequently unveiling on 24 March is to be installed where Salomon lodged with Haydn during that stay. 2015 marks 200 years since Salomon died and the RPS would like you to join them for an evening’s music with members of the Orchestra of the Age of Enlightenment and some food. Details of the event and tickets may be found here. 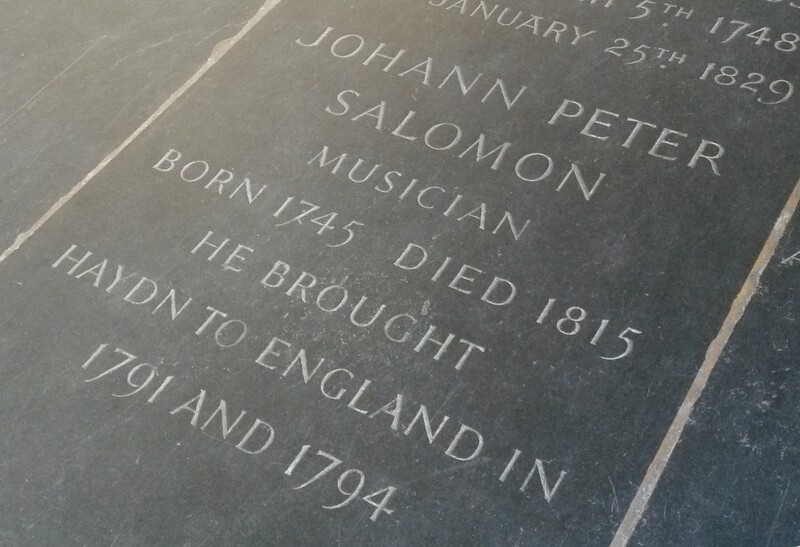 In the meantime you might like to go and visit Salomon’s own memorial (right) which lies in the South Cloister of Westminster Abbey.